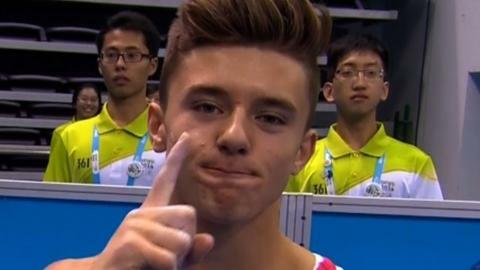 British gymnast Giarnni Regini-Moran claimed his second gold medal of the Nanjing Youth Olympics with floor victory on day seven in China. Regini-Moran, 16, scored 14.766 to head off the challenge of Japan's Kenya Yuasa (14.133) and Myongwoo Lim (13.766) of Korea. Team-mate Ellie Downie followed up her all-around bronze on Wednesday with vault silver. Francesca Summers finished second in the modern pentathlon competition. It means Team GB have now claimed 17 medals in Nanjing, far exceeding their total of nine from the inaugural Singapore Youth Olympics in 2010. Regini-Moran's winning streak began with the all-around title on Tuesday and he could yet add to his haul in any of the three individual events he competes in on Sunday. "It's unbelievable to come away with two gold medals so far," he said. Downie scored 14.566 to finish behind China's Yan Wang (14.783), but equal with Japan's Sae Miyakawa. "The all-around gave me a big confidence boost and those vaults were pretty close to my best," said Downie, who will return for the floor and beam events on Sunday. Summers had impressed in Friday's fencing ranking round and again excelled in the field, placing second in the final standings. She was the 11th quickest in the 200m freestyle event, but a sixth-place finish in the running-shooting combined discipline saw her climb into the silver-medal position with 1,044 points. "It was the hottest conditions I have ever run in but well worth it," she said after finishing behind China's Xiuting Zhong who scored 1,054. "Winning the medal has given me loads of experience for the future and who knows, maybe Rio next." British boxers Muhammad Ali (52kg) and Peter McGrail (56kg) both won their preliminary round events and will return for their respective semi-finals on Sunday. Heavyweight boxer Viddal Riley will also begin his campaign knowing one victory will guarantee him at least a silver medal.